I’ve been following a wonderful series of post at Taken by the Wind that highlights some ways folks carry their love of travel into all aspects of life and home. While I do love the inspired tattoos, don’t think something like that is right for me. However I do wear a different kind of symbol about my roving. 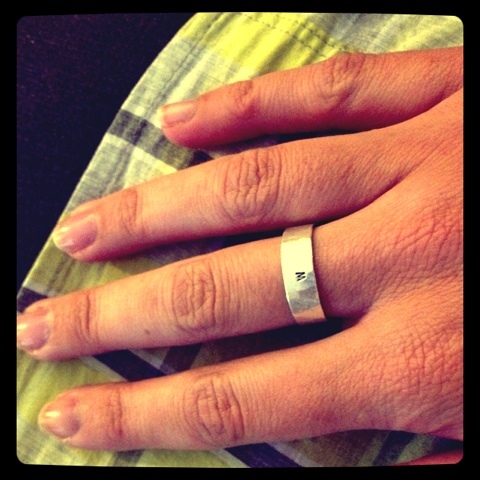 I wear a ring on my right hand that it engraved with N,E,S,W. A compass, always there to give me direction. I had it made by a jeweler on Esty, Kathryn Riechert. It’s very subtle, no one notices the letters and if they do the compass directions don’t register. To me it is perfect and for someone who is always moving around, having a little reminder that I know were I’m going it nice. This entry was posted in Life on the Road, Travel Life, Travel Tuesday and tagged Compass Ring, Kathryn Riechert, Travel Themed Jewelery. Bookmark the permalink.